Collector cars are big business and, for the first time, sales of sought-after vehicles at public auctions have crossed the $1 billion mark in a single year. Roughly $1.3 billion worth of automobiles will have been sold at collector car auctions in the United States in 2013, according to data from the collector car insurance company Hagerty Insurance. In 2004, that figure was around $282 million, or less than $350 million when adjusted for inflation, according to Hagerty. That's a more than 270% increase in a decade. Experts say the huge increase is not only due to more cars being sold but also the fact that those cars are going for higher prices. The average price of a car sold at a collector auction has risen from $33,000 in 2004 to $61,000 this year. The sheer number of cars sold at auction has gone from 8,600 to 19,600 over that time, according to Hagerty. Because Hagerty only counts U.S. auctions its figure doesn't include, for instance, the world-record sale of a 1954 Mercedes-Benz race car for $30 million at a July auction in England. It does, however, include the $27.5 million sale of a 1967 Ferrari convertible in California in August. That marked highest price ever paid at auction for a Ferrari. Also left out of this figure are all the private person-to-person transactions which constitute the vast majority of collectible car sales. Every year, roughly 80% of all collector car sales happen between individuals and not at public auctions, experts say, but because of their private nature it's virtually impossible to gather reliable data on those transactions. Auction companies and experts in the field cite a number of factors driving the huge increase in auction sales including an influx of international buyers and an increasing number places and events at which buyers can drive, display and enjoy classic cars. "This is really kind of a lifestyle hobby," said Alain Squindo, vice president of RM Auctions. "There are races, rallies, concours events." There are classic car events of some sort taking place virtually every weekend, he said. 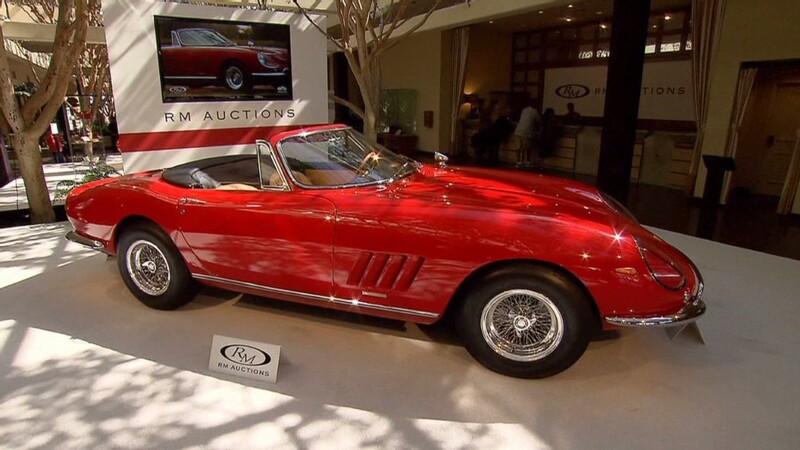 RM Auctions is the company that sold that $27.5 million Ferrari at Pebble Beach this year. Increasing globalization is also driving prices higher said Craig Jackson, president of the auto auction company Barrett-Jackson. "It used to be the U.S. and Europe trading cars, then Japan came in," he said. "Now there are big collectors in Asia and Russia which are creating more demand." Many buyers are also seeing classic cars as an alternative "asset class" in which to invest money, said David Gooding, president of the auction firm Gooding & Co.
"A lot of people say they'd rather put it into some sort of hard asset," he said. A similar trend has been driving prices in the market for high-end collectible works of art, said Alan Bamberger, a consultant at San Francisco-based ArtBusiness.com. "There's a lot of people with a lot of money and not enough places to put it," he said.